After taking a break for more than a month, I am so lazy to prepare bento and forgotten what was the number of my last bento. I have to check my last post on bento to find out. 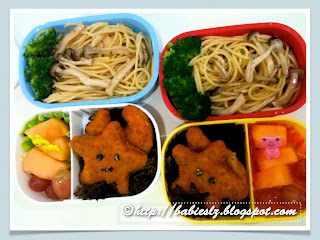 In the boxes: Pasta salad with Japanese dressing, broccoli, baked nuggets, rock melon & grapes. Today bentos are very easy to prepare. Nuggets were oven baked and I need not fry the pasta. I need to pick up the momentum to start preparing bento again.